The Lomé Container Terminal (LCT), in Lomé, Togo, has renewed its service contract with Paterson Simons for a further two years. Paterson Simons currently services 22 Konecranes rubber tyred gantry cranes (RTGs), 9 ship-to-shore cranes plus nine Alimak Hek lifts and 50 spreaders. With a dedicated workshop, and a permanent staff complement of 27, the undertaking to keep all cranes and lifting equipment running ship-shape is not a small one. 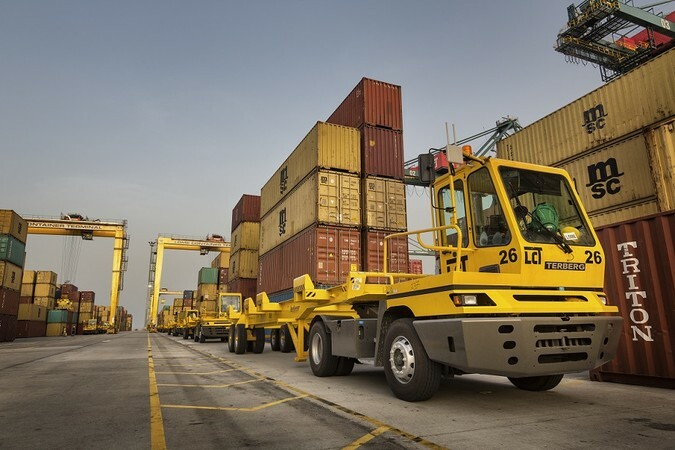 As the largest-ever private investment project in Togo, the TIL operated terminal has ambitions to become West Africa’s premier transshipment hub. The terminal currently employs 460 people and aims to soon achieve a capacity of 2.2 million TEUs per year. BELOW: The terminal also operates a fleet of Terberg tractors, as well as Konecranes reachstackers.